Pre-Note: As I’m sure the astute could glean from the length of this article it was in no way written within the fifteen minute time constraint outlined below. As such, I’m not entirely certain I’ll keep the “Half Hour of Power” moniker for very long if all the play sessions and reviews take this considerable amount of time. This game has been on my radar for quite some time and I’ve had it downloaded for several months now. At its most base form, Rogue Legacy is a simple MetroidVania platformer with randomly generated heroes and randomly generated dungeons. The twist comes with the concept of “heirs”. Instead of a conventional life system or save states, Rogue Legacy has you take up the mantle of a new hero after every death. Stats, weapons and armor, upgrades, etc. carry down the generational ladder (presumably under the guise of “family heirlooms and secrets”), but each hero is unique based on three factors: class, traits, and spells. Classes and spells don’t stray far from the tropes common to the genre, but traits are where Rogue Legacy really shines. The overall idea is interesting. 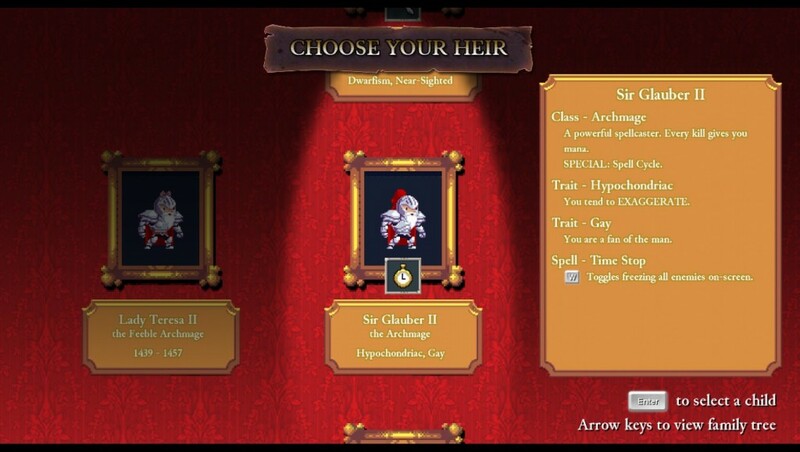 A randomly generated assortment of traits is applied to each of the three “heirs” you are able to chose from at the onset of each life. These traits range from toying with common themes of the genre (ADHD allowing for a faster character) to slapstick comedy (irritable bowel syndrome causing your character to flatulate every few steps) to simply pointless (I’ve yet to discern what the “Bald” trait entails). Combinations of these traits can both truly debilitate (the dyslexic Alzheimer’s patient I rolled was quite infuriating) or greatly improve (Roided Giganticism) your playing experience. (Albeit, you will occasionally get rather odd combinations, such as the bald, gay, and beared, the character sprites are also all RNG based, Lady Priscilla III.) This combined with the various class and spell combinations makes each trek into the castle both unique and challenging in its own regard. It seems you take after your mother. In addition to somewhat customizing your character creation, you are also given a “castle” to build with various upgrades. These upgrades are directly representative of your hero’s level, which means that gold directly influences your stat gains to a far greater degree than normal MetroidVania style games. This lead to several of my runs in the castle being much more focused on destroying furniture and opening chests than slaying enemies, as the gold defeated foes yielded was paltry in comparison to the gold lying in various candlesticks and tables. Not to mention the 300+ gold to be found in the room prior to the first boss’s lair. Personally, I found this to really trivialize the action in the gameplay, as enemies became reduced to multi-hit obstacles instead of being engaging threats to my adventures. 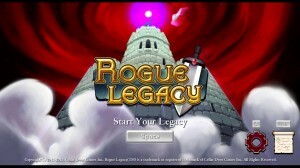 But what this really reveals is the main problem with Rogue Legacy as a whole: scaling. Now, I’m aware that doing procedural generation in games is quite in vogue and that successfully doing so requires a decent amount of programming knowledge; however, it’s also the reason for several blatant issues I found with this game in terms of proper scaling. By having the castle be generated each turn, I feel I can safely presume the end result isn’t nearly as large as say, Casltevania: Symphony of the Night’s map. This means each area must be smaller, and thus, each area must contain a steeper difficulty curve. Now, before I go on, I want to state that I realize part of the charm of these 2D action-platformers is the difficulty and that quite a few masochists have been born among the retro crowd, but that doesn’t mean improper scaling can be ignored by using difficulty as a catch-all scapegoat. Let’s juxtapose the first boss of Rogue Legacy, Khidr, and the first boss of SotN, Gaibon, to emphasize this point. Khidr is a level 37 boss, whereas Gaibon is a level 6 boss. Khidr has upwards of 1000+ HP (if my calculations of my hits are correct), Gaibon has 200. Gaibon’s room is rather large with multiple ledges to utilize for dodging, Khidr’s room is extremely confined and his projectiles are reminiscent of a boss from one of CAVE’s shmups. I reached Khidr on my fourth or fifth hero being just at level 8, if memory serves I generally get to Gaibon at level 4-6. The biggest difference is that I have literally never lost a fight with Gaibon, and yet, 20+ heroes into Rogue Legacy I have yet to down Khidr. Now, some might be saying, “You just need to grind some levels”, but I find it hard to swallow that at level 15 I can’t defeat the first boss of a game. Furthermore, grinding is made even more obnoxious than normal by the “Charon” character that requires your unspent funds as payment to enter the castle. The newest Adventure Time game tried this garbage, and though a host of other problems beleaguer that mess of a game, it’s equally as infuriating there as it is here. If you are going to require I spend an ever increasing amount of gold to level up my character and then proceed to drain my coffers at each life, then not a happy adventure will you make. I can understand that it was implemented as a way to stymie your character’s progression, and on my last adventurer I unlocked an ability to drive the pillaging tax down, but its still an absolutely diabolical way to force more playtime out of an already short game. (Note: I’m assuming that eventually you will be able to clear the entirety of the castle in one run.) This coupled with the lack of diversity in areas (I made it to two other areas, the Maya and the Darkness, exactly once because the enemies there were at least 40+ levels higher than me) made each journey more and more of a slog as I sensed a pattern repeating: gather gold -> die -> buy upgrades -> repeat ad nauseam. It started to feel more akin to slowly chipping away at a wall Andy Dufresne style, than delving into the depths of a mysterious ever-changing keep. It lost all agency. Also, another minor annoyance was the total lack of hidden rooms. I hacked away at every wall I came across for a while before I gave up trying to make it crumble. But I’ve harped enough, let’s talk about a lot of what Rogue Legacy does right. Again, the trait system really puts a unique spin on the genre and allows for a wide diversity in challenge. The music is quite fitting for the tone of the game, though I find myself growing bored of the “Castle” theme and relishing the few moments I’ve spent in the Maya. Albeit, I did find a jukebox in one area that cycled through a rather large selection of tracks. So I’m curious as to where the rest of the soundtrack shows up. The graphics are nice to look at, though again, spending so much time in one area has kind of dulled the look slightly and allowed me time to realize there’s a lot of reused assets. Which isn’t inherently a bad thing, just something I might not have initially noticed had I not been viewing the same textures for the entirety of my play time. Though I will say I only saw a direct copy of a room’s layout once in my entire journey thus far, which is impressive and I applaud whomever designed the procedural algorithm for the map layout. The controls are tight and on-point, exactly what you would except from a game of this genre. Story-wise, I think I see the endgame here, but I’m hoping that if I manage to make it that far (or look up the ending) it will surprise me. Also, I thought that they really missed an opportunity to tie the years each hero lived into the game mechanics. Either by having it be how many minutes you survived or how many rooms you cleared correlate to how long that hero lived. Alas, I believe it’s just another RNG computation. Overall, Rogue Legacy delivers on that itch so many gamers currently just can’t seem to scratch with its MetroidVania styling infused with RPG elements. It’s a fairly enjoyable experience initially and plays like a dream. However, poor scaling and a future of endless grinding hurt its chances at receiving a full-playthrough and ultimately condemn what was otherwise looking to be a “cult-classic” of the genre. The amount of procedural generation and algorithmic programming deserve the praise they garner. The music and graphical design being high quality as well, though marred somewhat by overexposure due to constant retreads of familiar territory. The trait system gives it the “stand-out” factor so many games are missing these days and the various upgrades and items will keep players who don’t mind the grind invested for the long haul. Lack of diversity in area design was disappointing, but, on the whole, I left Rogue Legacy feeling refreshed and excited to embark on this journey through many more games to come. The heir system seems like a refreshing take on the idea that Infinity Blade had. I only played the first Infinity Blade, but I liked how when you died in that game, your “son” would take over in your name. Problem was, no difference between your current character and son would be seen, so it’s basically just a story cop out of reviving yourself.